NASA WALLOPS FLIGHT FACILITY, VA – The Orbital ATK Antares rocket is all set for a breakfast time blastoff from the commonwealth of Virginia to the International Space Station for NASA with a Cygnus cargo freighter named in honor of Gene Cernan, the last man to walk on the Moon. The Antares launch is targeted for 7:37 a.m. EST on Saturday, Nov. 11, 2017 carrying the S.S. Gene Cernan resupply vessel that’s loaded with nearly four tons of science and supplies for the six person crew serving on the station. Antares liftoff with the Cygnus spaceship also known as OA-8 will take place from launch Pad-0A at NASA’s Wallops Flight Facility located along the eastern shore of Virginia. The rocket was integrated with the Cygnus OA-8 supply ship this week and rolled out to the launch pad starting around 1 a.m. EST this morning Thursday, Nov. 9. The upgraded Antares rocket was erected into the vertical position and is now poised for liftoff early Saturday morning. Tens of millions of spectators could potentially witness the launch with their own eyeballs since NASA’s Wallops Flight Facility is located within a short driving distance of the most heavily populated area of the United States along the eastern seaboard. Since Saturdays weather forecast is quite favorable at this time this could be your chance to watch an exciting launch on a critical mission for NASA with your family or friends. See detailed visibility map below. But be aware that temperatures will be rather chilly, setting record or near record lows in the 20s throughout the Northeast and Atlantic coast states. If you are wondering whether to watch, consider that Antares launches are infrequent. The last Antares launch from Wallops took place a year ago on 23 October 2016 for the OA-5 cargo resupply mission to the ISS for NASA. If you can’t watch the launch in person, you can always follow along via NASA’s live coverage. The launch window opens at 7:37 a.m. EST. The windows runs for five minutes extending to 7:42 a.m. EST. The 14 story tall commercial Antares rocket will launch for only second first time in the upgraded 230 configuration – powered by a pair of the new Russian-built RD-181 first stage engines. The Cygnus spacecraft will deliver over 7,400 pounds of science and research, crew supplies and vehicle hardware to the orbital laboratory and its crew of six for investigations that will occur during Expeditions 53 and 54. The S.S. Gene Cernan manifest includes equipment and samples for dozens of scientific investigations including those that will study communication and navigation, microbiology, animal biology and plant biology. The ISS science program supports over 250 ongoing research investigations. “Orbital ATK is proud to name the OA-8 Cygnus Cargo Delivery Spacecraft after former astronaut Eugene “Gene” Cernan,” said Orbital ATK. The last Cygnus was named the S.S. John Glenn, first American to orbit Earth, and launched atop a ULA Atlas V in March 2017. After a two day orbital chase Cygnus will reach the stations vicinity on Monday, Nov. 13. “Expedition 53 Flight Engineers Paolo Nespoli of ESA (European Space Agency) and Randy Bresnik of NASA will use the space station’s robotic arm to capture Cygnus at about 5:40 a.m. NASA TV coverage of rendezvous and capture will begin at 4:15 a.m.,” said NASA. Under the Commercial Resupply Services (CRS) contract with NASA, Orbital ATK will deliver approximately 28,700 kilograms of cargo to the space station. OA-8 is the eighth of these missions. KENNEDY SPACE CENTER, FL – The next Cygnus cargo ship launching to the International Space Station (ISS) has been christened the ‘S.S. John Glenn’ to honor legendary NASA astronaut John Glenn – the first American to orbit the Earth back in February 1962. The naming announcement was made by spacecraft builder Orbital ATK during a ceremony with the ‘S.S. John Glenn’, held inside the Kennedy Space Center (KSC) clean room facility where the cargo freighter is in the final stages of flight processing – and attended by media including Universe Today on Thursday, March 9. “It is my humble duty and our great honor to name this spacecraft the S.S. John Glenn,” said Frank DeMauro, vice president and general manager of Orbital ATK’s Advanced Programs division, during the clean room ceremony in the inside the Payload Hazardous Servicing Facility high bay at NASA’s Kennedy Space Center in Florida. The S.S. John Glenn is scheduled to liftoff as the Orbital ATK Cygnus OA-7 spacecraft for NASA on a United Launch Alliance (ULA) Atlas V rocket launch no earlier than March 21 from Space launch Complex-41 (SLC-41) on Cape Canaveral Air Force Station, Florida. The space station resupply mission dubbed Cygnus OA-7 is dedicated to Glenn and his landmark achievement as the first American to orbit the Earth on Feb. 20, 1962 and his life promoting science, human spaceflight and education. “John Glenn was probably responsible for more students studying math and science and being interested in space than anyone,” said former astronaut Brian Duffy, Orbital ATK’s vice president of Exploration Systems, during the clean room ceremony on March 9. Glenn’s 3 orbit mission played a pivotal role in the space race with the Soviet Union at the height of the Cold War era. “He has paved the way for so many people to follow in his footsteps,” said DeMauro. All of Orbital ATK’s Cygnus freighters have been named after deceased American astronauts. Glenn is probably America’s most famous astronaut in addition to Neil Armstrong, the first man to walk on the moon during Apollo 11 in 1969. John Glenn went on to become a distinguished U.S. Senator from his home state of Ohio on 1974. He served for 24 years during 4 terms. He later flew a second mission to space aboard the Space Shuttle Discovery in 1998 as part of the STS-95 crew at age 77. Glenn remains the oldest person ever to fly in space. “Glenn paved the way for America’s space program, from moon missions, to the space shuttle and the International Space Station. His commitment to America’s human space flight program and his distinguished military and political career make him an ideal honoree for the OA-7 mission,” Orbital ATK said in a statement. “The OA-7 mission is using the Enhanced Cygnus Pressurized Cargo Module (PCM) to deliver cargo to the International Space Station,” said DeMauro. Cygnus will carry 7,700 pounds (3500 kg) of cargo to the station with a total volumetric capacity of 27 cubic meters. This is the third Cygnus to launch on an Atlas V rocket from the Cape. The last one launched a year ago on March 24, 2016 during the OA-6 mission. The first one launched in December 2015 during the OA-4 mission. “We’re building the bridge to history with these missions,” said Vernon Thorp, ULA’s program manager for Commercial Missions. Overall this is Orbital ATK’s seventh commercial resupply services mission (CRS) to the space station under contract to NASA. OA-7 also counts as NASA’s second supply mission of the year to the station following last month’s launch of the SpaceX Dragon CRS-10 capsule on Feb. 19 and which is currently berthed to the station at a Earth facing port on the Harmony module. 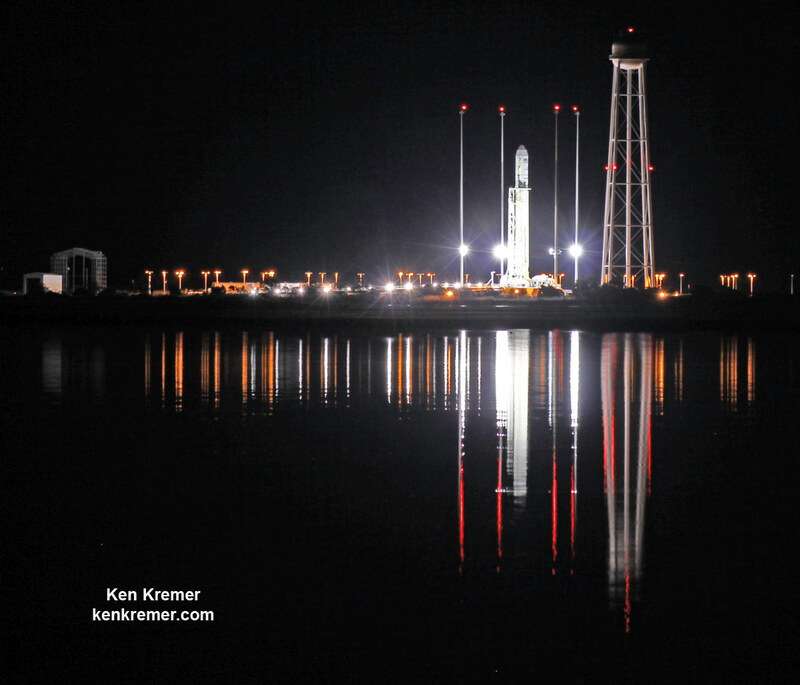 The Cygnus OA-8 mission will launch again from NASA Wallops in the summer of 2017, DeMauro told me.